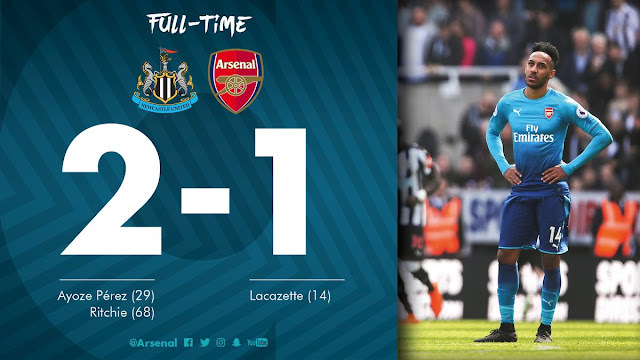 Arsenal’s poor away form continued as they were beaten 2-1 at St James’ Park against a resurgent Newcastle United on Sunday afternoon. Alexandre Lacazette gave the Gunners an early lead on, only for Rafa Benitez’s side to fight back with goals from Ayoze Perez and Matt Ritchie securing them a famous win. Arsenal weren’t at their fluent best after the exertions of Thursday night when they faced CSKA Moscow in the Europa League, as they reached the last four of the competition. It was a much changed team which Wenger named for the trip to Newcastle as Rob Holding, Calum Chambers and Joe Willock were all given rare chances to impress. They were always a threat with Lacazette and Pierre-Emerick Aubameyang but found it difficult to get through a stubborn home defence in a very exciting contest in the North East. Here is how we rated the Gunners following the defeat against Newcastle.